We call this part as the source of growth since the underlying trigger for behavior is coming from free self. That is the reason why we have chosen the color of energy, sun. Looking for continuous improvement, taking responsibility for own reality, and apparently knowing what is happening in our mind. 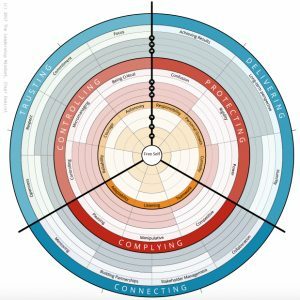 All the values -not limited to- listed in this circle are part of the Self-awareness. Those are potentially limiting behaviors triggered by the needs of the ego. We call them potentially limiting since they are helpful if we apply them in right doses. This dimension is a part which requires more attention, that’s why it is red/rose. Typical behaviors in this so-called ego-circle are: giving more emphasis to protecting over serving, controlling rather than trusting or complying instead of making genuine connections. Behaviours are having their source of freedom, with less ego in other words with less fear. 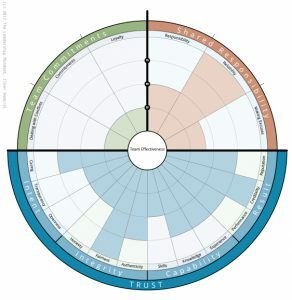 Key is here being in service, delivering, making partnerships, connections and nurturing trust. As the color of “trust” is blue, we have chosen the blueish outer circle. The Leadership Mindset Profile shows the shadow or the reflection of our mindset. This view immediately increases our awareness of the operating system of our mindset build around our free self. Furthermore, it reveals how the fear, ego-based dimension impacts our leadership effectiveness. As a result, leaders have an opportunity to see how their mindset determines the effectiveness of their leadership. Team Effectiveness gives you a clear picture of how the team is performing. What is the level of trust in the group? How is the team sharing the responsibility? Is there a collective accountability present? Is the team ready to handle conflicts? Is the team continuously improving? And more important: is the team delivering the expected outcome with the highest quality? This influential Team Effectiveness assessment is a core of self-organized top performing teams.